The Archive has been sent this image of what is believed to be North Loftus (Skinningrove) Mine workers, it is believed that both Danny Found and Harold Found are in the photograph. Can anybody help? Left to right: ? ?, ??, ? ?, Danny Found, Harold Found, ? ?, ??, ? ?, ??. Image courtesy of Eileen Found. 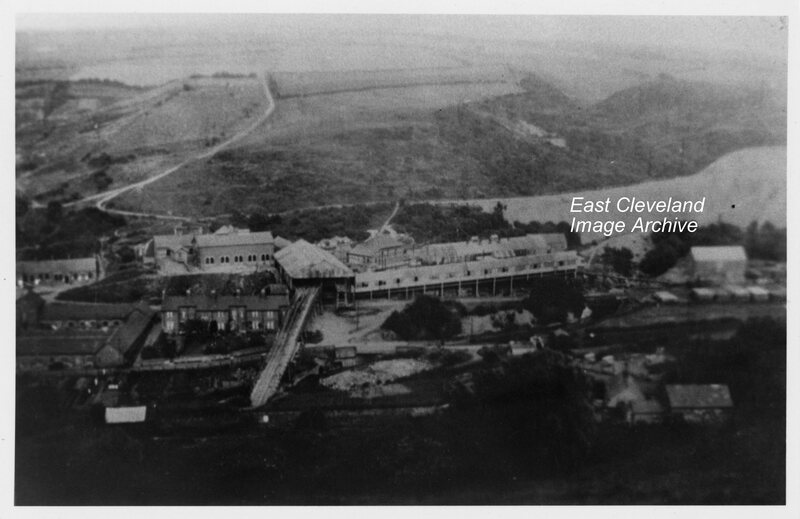 This image of the mine predates the installation of the aerial ropeway to the ironworks. 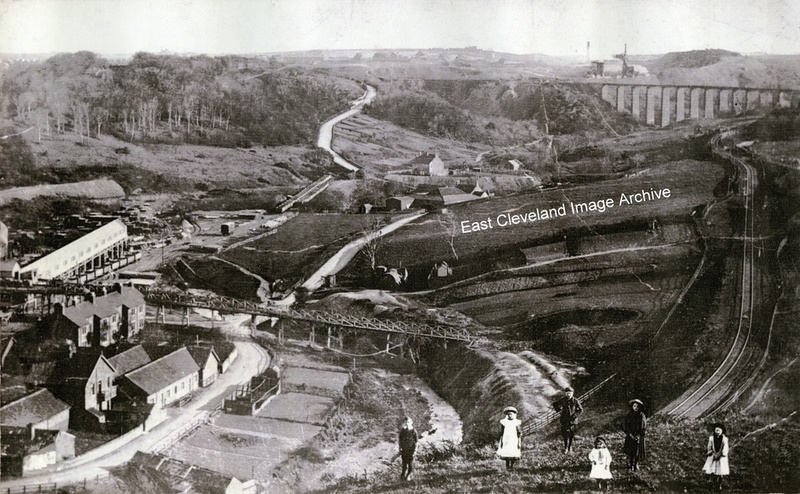 The picking belt and trestle bridge to the North Loftus shaft are clearly seen. 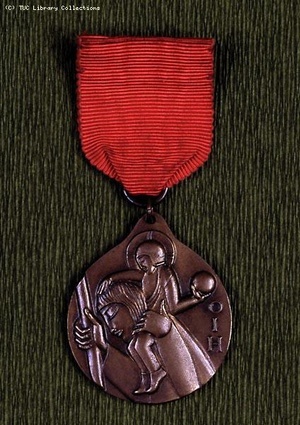 The Daily Herald, Instituted the Order of Industrial Heroism to recognise the ”Deeds of Valour” of those workers who had saved their fellow workers from danger of death. This became known as the ”Workers V.C.” Many of the recipients were awarded posthumously and also received other awards including the George Cross, George Medal and Royal Humane Society Medal. Just over 400 Workers V.C.s were ever awarded. J.M. 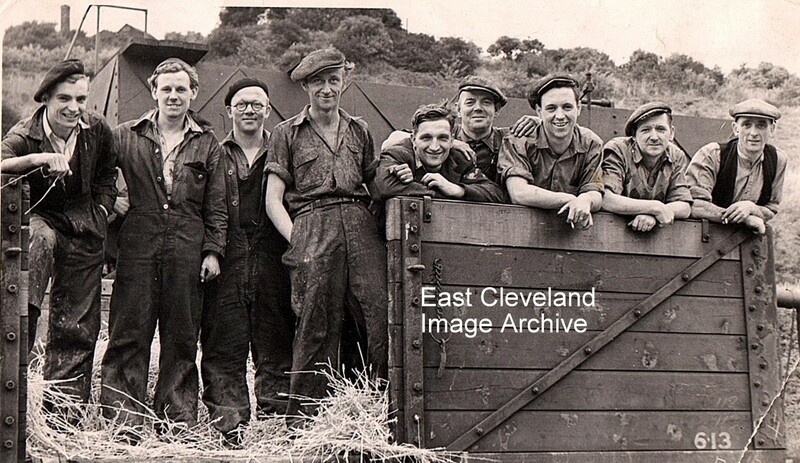 Easton (Overman at Loftus Mine, Skinningrove) was presented with the Medal at the Union Council Middlesbrough on 14th December 1946. He was the 177th recipient. 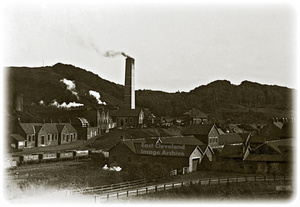 A panorama of Skinningrove valley. 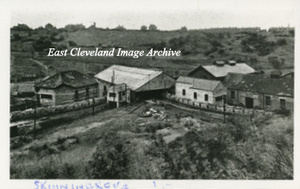 The mine is on the left, with overmen’s cottages next to the trestle bridge which crosses the beck to the drift into the bottom of Loftus north mine, the shaft used to hoist ironstone to the works. On the left the white enclosure of the newly built picking belt (1907), for cleaning the ironstone can be seen. Towards Mill bank, the mine rail sidings cross the beck this was originally extended to the old Whitecliffe mine. Kilton Viaduct is yet to be filled in, with Liverton mine above it. and the rail zig zag skirts the right hand side down the valley. Image courtesy of Jean Carass. An interesting photo of the mine predating the installation of the picking belt (1907). 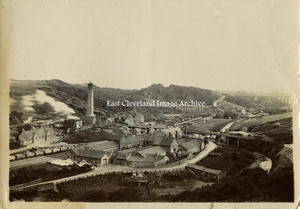 the boiler chimney and steam from the Fan engine are clearly seen, The extensive stables complex for the mine horses (not ponys), dominates the centre of the photo. In the rail sidings a rake of wagons are loaded with ironstone. And towards mill bank is the stockyard stacked with timber for pit props. On The eastern side of the valley behind the mine is seen deepdale wood this slowly disappeared under a mountain of shale in later years.Image courtesy of Olive Bennett. A view from Wood Road overlooking Skinningrove Mine buildings (but minus aerial ropeway) and Carlin How on the skyline. An early image of the mine; Deepdale valley has not been filled in with shale at the date of this photograph. The semi circular mine fan housing of possibly the Cooke ventilating fan, can be seen. The building and fan were replaced by a 30 foot diameter Waddel fan. David Richardson tells us: ”Taken sometime in the 1890′s, both the 1872 and 1874 Cook’s Fan houses are visible with the Compressor House and Boiler Plant Chimney behind them. A little away from those to the right is the Hauler House for the South Drift. On the hillside to the left of the photo is a large chimney which was the original furnace shaft for ventilating the North drift but was likely only used for a few years before the 1872 Cook’s fan took over. Image kindly loaned by Michael Garbutt and many thanks to David for the update. 1939, Sorting shale from ironstone on the large convetor belt at Loftus where the ironstone mine re-opened after being closed since last August. 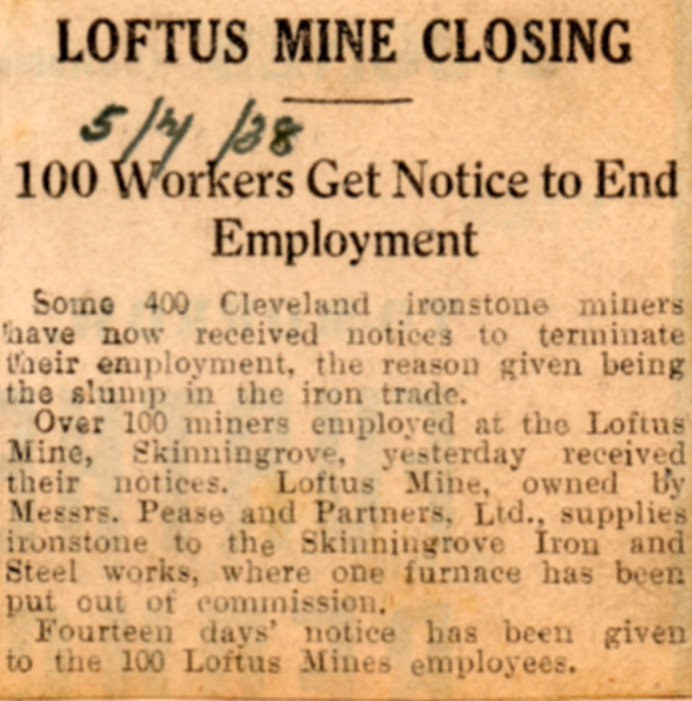 This will mean employment for several hundred men, the ore extracted will be supplied to Skinningrove Iron works where 2 addition calcing kilns are ti be re-lighted. The second picture is the first load up at Loftus. 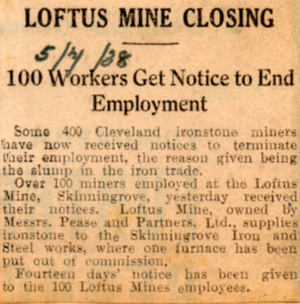 How many times did Loftus mine close and then re-open? 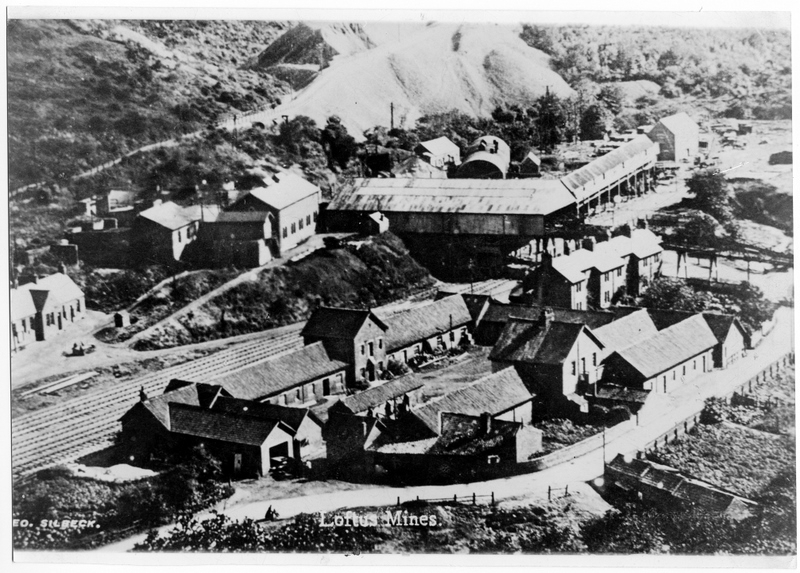 A lovely photo of the mine, but I think it may be a postcard. Someone has cropped the card (not guilty) but part of Geo. Skilbeck’s name can still be seen.